Closer Than Ever. February 10 – March 6. Music and Lyrics by Richard Maltby, Jr. and David Shire. Filled with hilarious and poignant songs about dating, parenting, aging and dreams both fulfilled and unrequited, Closer Than Ever is like a musical “how-to” manual for life. With each song a self-contained story inspired by real-life experiences, its message to value the little things in life remains timeless. Alas, I just saw the excellent Good People Theatre Co (FB) production of the show at Hollywood Piano Co. [writeup]. Once you have heard it on a wonderful 9½ foot Mason & Hamlin grand piano, who needs Long Beach? ‘A Walk in the Woods. April 27 – May 22. by Lee Blessing. Lee Blessing’s brilliant and funny play of ideas, based on an actual event, is a stunningly powerful and provocative drama that seems more timely than ever and probes the most important issue of our time – the very survival of our civilization. Nearing the end of the Cold War, a pair of arms negotiators – a clever, cynical Russian and an idealistic young American – meet in the woods outside Geneva to explore the obstacles their countries face on the path to peace. Can personal bonds bridge political chasms? Although I haven’t seen this, the subject is not a sufficient draw to make me brave the traffic to Long Beach. Vanya and Sonia and Masha and Spike. June 8 – July 3. by Christopher Durang. One of the most lauded Broadway plays of recent years, this witty mash-up of Chekhov characters and smartphones is a delightful new comedy for our hyperconnected era. Middle-aged siblings Vanya and Sonia live an angst-ridden, melancholic existence on their Bucks County, PA family farm. That is, until their glamorous movie-star sister, Masha, swans in for a surprise visit-along with her hunky 20-something boy toy, Spike. We saw this play in early 2014 when it was at the Mark Taper Forum (FB) [writeup]. Although entertaining, it’s not unique enough to make it worth the drive to Long Beach. Doubt, A Parable. August 17 – September 11. by John Patrick Shanley. John Patrick Shanley’s riveting psychological drama examines the fine line between what seems certain and ambiguity, between conviction and doubt. It is 1964, a time of movement and change, but Catholic school principal Sister Aloysius values a stern hand over progressive education. When evidence points to an inappropriate relationship between Father Flynn and the school’s first black student, she begins a crusade to rid the church of him. We saw an excellent production of this earlier this year at Rep East Playhouse (FB) [writeup] with the wonderful Georgan George (FB) as Sister Aloysius and Jeff Johnson/FB as Father Flynn. We also saw it back in 2005 at the Pasadena Playhouse (FB) [writeup]. Again, no strong urge to go to Long Beach to see it. Shipwrecked! An Entertainment – The Amazing Adventures of Louis de Rougemont (as Told by Himself). October 12 – November 6. by Donald Margulies.A celebration of storytelling, this theatrical adventure is based on the real-life autobiography of Louis de Rougemont. An intrepid explorer, Rougemont’s amazing tales of bravery, survival and exotic locales left 19th century England spellbound. Join Louis and two other actors playing more than 30 characters in a high seas adventure with flying wombats, giant sea turtles and more. Although this sounds like it could be a humorous play, it doesn’t sound like something with sufficient draw to bring me to Long Beach. So, you’re probably wondering, what does draw me to Long Beach. First, when ICT does musicals that I’ve only heard or heard about, but never seen. Their productions of Loving Repeating, The Robber Bridgegroom, and Once on this Island fell into this category. Second would be a production of something I’ve heard about on Broadway and want to see, but hasn’t been done elsewhere in LA. Is He Dead? fell into this category. And They Say Parents are Civilized. Hah! Last spring, the New York cast of “God of Carnage” visited the Ahmanson Theatre. I wanted to see the show, but the discount tickets were extremely limited and difficult to get, and it passed me by. Luckily, International City Theatre in Long Beach selected the show to open their 2012 season, and we decided to skip the Super Bowl and go see it instead. For us, the story is the key, not particular names in the cast; in fact, we were happy to see a production where we’ve seen three of the four actors on Southern California stages. This was our second Yasmina Reza play in a row (last week was “Art” at the Pasadena Playhouse), and both had to deal with adults behaving like children. Last week, it was three men obstensibly arguing about a friend’s taste in art, whereas the real hurt was something much much deeper. Similarly, in “God of Carnage“, the surface argument is not what the real fight is about. (I’ll also note that both plays are 90-minute, one-act plays). “God of Carnage” tells the story of two parental couples who are brought together because their pre-teen children had a schoolyard brawl–specifically, Benjamin Raleigh had used a stick to hit Henry Novak and knock out two of his teeth (injuring the nerve of one of them) [later we learn this occurred because Henry refused to let Benjamin join his “gang” and called him names]. That evening, the parents of Henry (Veronica and Michael Novak) invite Benjamin’s parents (Annette and Alan Raleigh) over to discuss the matter, and to get their son to apologize personally to Henry. As the evening goes on, the parents civil discussion becomes significantly less civilized (especially after Annette vomits over the coffee table), and the veneer that we parents wear becomes ripped off. I could probably describe more, but as with “Art”, it is really best to watch and see the gory details as these to parents become children and brawl in the fancy living room. The production we attended had a talkback, and I asked how much came from the director and how much from the actors. Both noted they couldn’t be separated, giving the example of how after you have baked a cake, you can no longer separate the constituent ingredients. So I won’t attempt to do so; I’ll simply indicate that this is a delightful cake, indicating the skill of both the cook and the quality of the ingredients. In this case, the cook is the director, caryn desai, who is also the artistic director of ICT. The ingredients are Greg Derelian and Leslie Stevens as Michael and Veronica Novak, and David Nevell and Alet Taylor as Alan and Annette Raleigh. The cake is so thoroughly sweet that you can’t even separate the actors: all of them are great, and all of them give wonderful performances. As I indicated, we have seen most of them before: we saw Leslie and David at the Pasadena Playhouse, and Alet at Cabrillo and the NoHo Arts Center (I’ll also note that all are members of Actors Equity). Turning to the technical side. The set was designed by Stephen Gifford, who has done numerous productions at both ICT and the Colony, and did a very elegant New York apartment set. Lighting was by Jeremy Pivnick, and was very simple. Sound was by Chris Kittrell, and was reasonably good (my only complaint was that the cellphone sound effect didn’t come from the cellphone). Kim DeShazo was the resident costume designer; Gordon and Patty Briles were the resident property designers, and Michael Donovan was the resident casting director. Pat Loeb was the Production Stage Manager. “God of Carnage” continues at ICT through February 19. Tickets are available through the ICT online box office. Upcoming Theatre, Concerts, and Dance: Next weekend sees us in Thousand Oaks for “Ring of Fire” at Cabrillo Music Theatre on February 11. The third weekend of February has two shows: Saturday night we’re in Saugus for “Jewtopia” at REP East; the following afternoon we’re in Sierra Madre for “On The Twentieth Century” at the Sierra Madre Playhouse. February concludes with “Old Wicked Songs” at the Colony Theatre. March is equally busy, beginning with “How to Succeed in Business without Really Trying” at Van Nuys High School (March 2-3 and 8-10; we’re likely going on 3/2), and Bernadette Peters in concert at the Valley Performing Arts Center on March 3. March should also bring “American Idiot” at the Ahmanson, and “Journey’s End” at REP East. March will conclude with Tom Paxton in concert at McCabes on 3/31. Continuing the look ahead, April will bring “Billy Elliot” at the Pantages, the Southern California Renaissance Faire, “Once Upon a Mattress” at Cabrillo, and “Dames at Sea” at the Colony. As always, open dates are subject to be filled in with productions that have yet to appear on the RADAR of Goldstar or LA Stage Alliance. Would I lie to your face? That’s exactly what happened, once upon a Natchez Trace. When you think about a musical, you think about a full orchestra (or five to seven instruments masquerading as such). You typically don’t think about a 4-piece bluegrass quartet of piano, bass, fiddle, and banjo/guitar. But bluegress music and an old country spirit is at the heart of the musical “The Robber Bridgegroom“, which we saw last night at ICT-Long Beach (and which closes its run today at 2pm). The ICT production moved “Robber Bridgegroom“, which was on Broadway in the 1970s, to a right-size venue where it works perfectly. Combine that with perfect casting, perfect direction, and perfect music, and you have a delightful evening, once upon a Natchez Trace. “The Robber Bridgegroom“, based upon a novel by Eudora Welty with book and lyrics by Alfred Uhry (of “Driving Miss Daisy” and “Parade” fame) and music by Robert Waldman, tells the fable of the Robber Bridegroom in 1795 in Rodney’s Landing, Mississippi. It is a fable about, as the song says, “A gent and a robber all in one, A girl who made the moon burn like the sun. A greedy witch, A man that rich. A brain that big, A filthy pig. A talkin’ head.” So let’s meet the characters. The “gent and robber all in one” is Jamie Lockhart, a gentleman robber who is also the bandit of the woods. He charms to get in, and takes what he wants. The girl who made the moon burn like the sun is Rosamond, the beautiful daughter of the “man that rich”, Clemment Musgrove, a wealthy planter, and the step-daughter of the “greedy witch”, Salome, current wife of the planter. Rosamond wants love, and finds it with the bandit of the woods, but doesn’t want to get married to the gentleman her father prefers, Jamie Lockhart, who wants to marry Rosamond not for love, but for the plantation. The “brain that big” refers to the brain the size of a pea belonging to “Goat” the simpleton hired by Salome to kill Rosamond to gain the reward of a suckling pig. The “filthy pig” refers to Little Harp, a thief and robber who travels the country with the talkin’ head of his brother, Big Harp, and who plans to steal both the gold and the girl of the planter. As you can imagine from this cast of characters, we have a backwoods story of greed, love, lust, and desire. Quite a fun tale. What made this production so great was the combination of great directing by Todd Nielsen and a wonderful ensemble. This greatness starts before the show, where the townspeople (and musicians) wander the audience in character, interacting with the audience and being playful. Goat is out doing magic tricks with a coin. Rosamund is chatting with the front row about her hair. The harps and Jamie are out charming the audience. These people are family from the start, and this is just a friendly storytelling. It is wonderful direction. The ensemble was also wonderful. From the leads to townsfolk, everyone was great. As Jamie Lockhart, Chad Doreckæ was a charming rogue, a great singer that exuded charm. His match was Jamison Lingle as Rosamud—beautiful in face, beautiful in voice, and playful. What I particularly appreciated about Lingle was her facial expressions: this was an actor who was just having fun with this character, and that fun was infectious. Michael Stone Forrestæ played Clemment Musgrove, the planter, and again he was having fun with his role. Salome, his second wife, was played by Sue Goodmanæ. Strong singing voice, and again having fun with the character. If you haven’t figured out by now, what made this entire ensemble special was that they were having fun with each other, fun with their characters, and fun with the audience. No where was this better illustrated than with Adam Wylieæ‘s Goat, the simpleton who was just having fun enjoying life. As the brigands, Michael Uribes as Little Harp and Tyler Ledon as Big Harp were playful evil: not menacing, but not silly either. The last two characters were catchall roles, but were perhaps the most fun to watch for their facial expressions and side activities: Tatiana Mac as Airie (Goat’s sister) and the Raven, and Teya Patt as Airie and Goat’s mother. These two were in the background, but were so much into their characters that they were the icing on a perfectly constructed production. Of course, the musicians weren’t bad either. Under the musical direction of Gerald Sternbach (also on piano), the musicians (also in character and dressed as such) were having fun, and constituted a great bluegress quartet. Working with Sternbach was Roman Selezinka (fiddle), Gary Lee (guitar, banjo), and Brad Babinski (bass). The intricate choreography and movement, including square dancing, was also provided by Todd Nielsen, the director. Technically, the production was spot-on. Stephen Gifford‘s set turned the ICT stage into a two-level barn; when augmented with the props from Gordon and Patty Briles, what was created was a flexible space where two chicken coops and a board, plus a quilt, becomes a bed or a table, and a trunk suddenly contains a talking head. Donna Ruzika‘s lighting was effective and non-obtrusive, creating the mood and space without being annoying. Kim DeShazo costumes were reflective of the time, creative, versitile, and all-together just fun to watch. The sound design by Paul Fabre was, for the most part, great… starting with the cricket noises as you walked into the theatre. The only (very slight) flaw, if any, was a little bit of mic problems as the first act started that made things muffled, but that was quickly corrected (mind you, that was the only flaw). The production was produced by caryn desai, the artistic director; Pat Loeb was the production stage manager. The last peformance of “The Robber Bridegroom” at ICT-Long Beach is today at 2pm; if you read this in time, go see it. Tickets are available online. ICT has annoucned their 2012 season: “God of Carnage” by Yasmina Reza (January 24-February 19); “The Fix” with book and lyrics by John Dempsey and music by Dana P. Rowe (April 24-May 20); “Leading Ladies” by Ken Ludwig (June 5-July 1); “Ghost-Writer” by Michael Hollinger (August 21-September 16); and “Ain’t Misbehavin’“, a musical based on the life and music of Fats Waller (October 9-November 4). 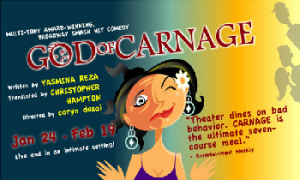 We’ll probably go to “God of Carnage“, as we missed it when it was at the Ahmanson, and ICT should do a good job. Upcoming Theatre, Concerts, and Dance: Next weekend brings “Day Out With Thomas” at Orange Empire (We’re working Veterans Day). Veteran’s Day weekend brings “Sylvia” at the Edgemar Center for Performing Arts in Santa Monica on Saturday 11/12; the following weekend brings “Chitty Chitty Bang Bang at the Simi Valley Cultural Arts Center on its opening night, November 19. Karen will also be seeing “Riverdance” at the Pantages on November 16. I’m still waiting to ticket “Bring It On” at the Ahmanson (held for November 25, pending ticketing, hottix on sale for our block on November 8). Thanksgiving weekend also brings the last show of the REP season, “The Graduate”, on Saturday November 26. The first weekend of December is lost preparing for ACSAC, although I might squeeze in something on Saturday. The next weekend is busy, with a Mens Club Shabbat in the morning, and “Travels with my Aunt” at the Colony Theatre in the evening. The remainder of December is unscheduled, but I’m sure we’ll fill things in for Winter Break. Of course, there is the de rigueur movie and Chinese food on Christmas day. January, right now, is completely open, although the first show of the REP East season will likely be in there somewhere. As always, open dates are subject to be filled in with productions that have yet to appear on the RADAR of Goldstar or LA Stage Alliance. Last night, we went to see “Loving Repeating: A Musical of Gertrude Stein” at ICT Long Beach. That is to say, it was in Long Beach that we saw “Loving Repeating at ICT. For the fact is, ICT is doing this wonderful presentation of “Loving Repeating, a musical about Gertrude Stein with music by Stephen Flaherty. Yes, it was in Long Beach, and it was Gertrude Stein and Alice B. Toklas, and it was a musical, and it was done by ICT. For in the repeating was the story, and the story, which was about loving, was in the repeating. My wife has a cow!! It is the movement of these thoughts and words that tells the love story of Stein and Toklas, Husband and Wife in a time where two women were not husband and wife, but these two were. The story begins with their meeting, and though incomprehensible lyric operas and lyrics we see the love grow, with the musical ending with Alice alone, as Stein has passed away. But there is never an explicit telling of their story: it comes through the musical as a sense, not explicit words. Perhaps this is the effect of the music, which is so lyric and beautiful you are instantly lulled into this sense of floating and relaxing. For those who are Ahrens and Flaherty fans, I do recommend the CD. The production of “Loving Repeating” at ICT was beautifully staged and executed, under the firm directoral hand of caryn desai (sic). The cast featured five women and three men, of which only three were named roles: Old Gertrude, Young Gertrude, and Alice. The rest flowed in an out (as the music flowed), building the pieces of the story around the narrative of the Gertrudes, conducted by the director and the choreography of Heather Castillo. The acting talent was excellent, conveying the joy of the music and the love that existed between everyone. The older Gertrude Stein was played by Cheryl Davidæ, who provided the basic narrative thread of the story. The younger Gertrude Stein, who did more of the singing, was Shannon Warneæ. We have seen Warne before as Geneveve in the Pasadena Playhouse’s Camelot and as Millie in Cabrillo’s Seven Brides; she has a wonderful singing voice and stage personality. Alice B. Toklas was portrayed by Melissa Lyons Caldrettiæ (who we also saw before at Cabrillo in both Cats and Peter Pan). The mixture of Warne’s and Caldretti’s voices was just magic. Rounding out the cast were Carly Bracco (a graduate of Thousand Oaks High) [Woman #1], Allison Eberly [Woman #2], Leland Burnett [Man #1], Jay Donnell [Man #2], and Tyler Milliron [Man #3]. This ensemble danced and moved well, and the voices blended to perfection. They were just a joy to watch. Turning to the technical: Kurt Boetcher designed the simple but beautiful set, which featured branches forming a heart in the background, and a stage platform with modernistic paintings on the ground. The costumes by Kim DeShazo were reflective of the period (the late 1800s and early 1900s), with a wonderful cubist dancing cow. Gordon and Patty Briles, the resident property designers, did a beautiful job of constructing the stage and providing the few props used. The lighting design by Donna Ruzika effectively conveyed the mood of the piece. The sound design by Joseph Slawinski started out clear and strong, but there were odd periods of echo-i-ness in the sound and static, indicating there was some form of transitory problem that was distracting. The musical team was led by Darryl Archibald, who led the five piece band. “Loving Repeating” continues at ICT Long Beach through February 13. At the performance we were at, there were lots of empy seats in the Loge. ICT has been putting some performances on Goldstar. Get them if you can; if not, full price isn’t all that bad. But if you like pretty music and don’t mind a story that doesn’t gel in your head until the end—if you enjoy floating on the music and watching beautiful staging, go see it. I’ve got the feeling that this is a musical that grows as you see it more and listen to it more. Dining Notes: Normally, finding good dining and good parking in downtown Long Beach is a pain. We found the answer. The Long Beach Cafe at 615 Ocean, about 5 minutes from the theatre, has free parking in its own lot. When you combine this with incredibly tasty food and plentiful portions, and you have a winner. We’ll be back. Upcoming Theatre, Concerts, and Dance: February starts with “Frankie and Johnny in the Claire de Lune” at Repertory East on February 4 (which got a great review), and “Dangerous Beauty” at The Pasadena Playhouse on February 5. The next weekend also brings two shows: “The Marvelous Wonderettes at Cabrillo Music Theatre on February 12, and “Adding Machine: The Musical at The Odyssey Theatre Ensemble on February 13. The third weekend of February is another with two shows: “Rock of Ages at The Pantages Theatre on February 19, and “33 Variations at the Ahmanson Theatre for February 20. February closes with “Moonlight and Magnolias” at The Colony Theatre on February 26. March is also busy. It begins with a Noel Paul Stookey concert at McCabes on March 4. March 5 is the MRJ Regional Man of the Year dinner at TBH. The first two weekends of March are also the Spring Musical, “Evita”, at Van Nuys High School; we’re likely going on Saturday, March 12. Sunday, March 13 is “The Cradle Will Rock” at the Blank Theatre. The weekend of March 19 is currently open, but that probably won’t last for long. Lastly, March 26 brings “The Diary of Anne Frank” at Repertory East. April will bring the Renaissance Faire, “The Producers” at Cabrillo Music Theatre, “The All Night Strut” at the Colony Theatre, and (pending ticketing) Brian Stokes Mitchell at the new Valley Performing Arts Center. In the classic American story “The Adventures of Tom Sawyer”, the title character attends his own funeral, just to hear the good things people are saying about him. Death has that interesting effect: we tend to focus about the good of the person. This is especially true in the art world: when an artist dies, no matter his quality, the value of his artworks often go up in value. So, suppose you have a penniless artist and his friends, who owe a lot of money, and they have just come to this realization. What do they do? The answer is simple: The artist must die. But before you think this is some murder plot, think again. The artist just comes back as his long-lost twin sister. Add to this a classic melodramatic villian (think “Musical of Musical” — “I must have the rent!”), an engenue in love with the artist, the villian in love with the engenue, and a second engenue in love with the artist’s best friend… who thought up the plot. Add to this a man dresses up as a woman, some limberger cheese, and lots of doors, and you have the making of a farce. A very good farce. I mention this because last night we went to see this farce. The play is called “Is He Dead?”, and was written by an author you might have heard of: Mark Twain. Almost a hundred years ago, he wrote this play, but no one knew about it until it was rediscovered a few years ago and mounted on Broadway to great critical reviews. It is currently having its Los Angeles premier at the International City Theatre in Long Beach. “Is He Dead?” tells the story of the French artist Jean-Francois Millet (Perry Ojedaæ), who owes a significant amount of money to Bastien Andre (Steve Marvelæ). Also owing Andre money is Papa Leroux (Jerry Hoffmanæ), father to the sweetheart of Millet, Marie Leroux (Suzanne Petrela). Neither can pay Andre; in particular, Millet can’t pay because his paintings aren’t selling. Millet’s pupils: Agamemnon “Chicago” Buckner (Brian Stanton), Hans “Dutchy” Von Bismark (Chip Bent), and Phelim O’Shaughnessy (Blake Silver)) come up with an idea: Millet’s paintings will be worth more if Millet is dead. So they invent an unmentionalable disease for Millet to contract and quickly die from, as well as a sister, the widow Daisy Tillou, who is Millet’s identical twin sister. Now, add to this mix Leroux’s other daughter, Cecile Leroux (Jules Hartley), who is in love with “Chicago”, and the two widowed landlady’s of Millet (Madame Bathilde (Terra Shelman) and Madame Caron (Jeanine Anderson)). Stir the mix with a number of love triangles (both Andre and Millet love Marie; both Papa Leroux and Andre love the Widow Tillou). Add misunderstandings and jelousy (Cecile thinks Daisy loves Chicago). Season with dialects and great comic timing, as well as a great supporting performance by Joe Friaæ as a British art patron (Basil Thorpe), a French detective (Claude Riviere), a servant (Charlie), and the King of France… and you have a very funny farce. Farce is very different than situational comedy. Situational comedy are plays such as “The Odd Couple” (Neal Simon), where the comedy come from the people and their relationships, not just sillyness. Farce is almost sillyness for sillyness’ sake — think “A Funny Thing Happened on the Way to the Forum” or “Noises Off”. There’s timing and doors slamming; there’s misunderstandings and overreactions; there’s dialects and cross-dressing (men as women, women as men). Everything is played for the laugh. Farce also requires spot-on timing. I do have to say that this company was excellent. Ojeda, as Jean-Francois/Daisy, milked the cross-dressing and the kissing for as much as he could get out of it. Marvel played the evil villian well, and Stanton was an excellent schemer. The reactions and timing of the whole cast was just remarkable. Turning to the technical side: ICT is a thrust stage, almost 3/4 round like the Mark Taper Forum. They had about 1/3 of their seats blocked off. The sets were mostly backdrops: in the first act, they portrayed Millet’s studio; in the second act, the opulant quarters of the Widow Tillou. The sets were designed by Stephen Gifford. The lighting was unnoticable (a good thing): there were no spots or lighting tricks, just overall lighting that established the time of day and mood. The lighting was designed by Bill Georges, assisted by Sean Conlin. The costumes (by Kim DeShazo) and wigs/hair (by Anthony Gagliardi) established the time period well and were quite creative. Props were designed by Patty and Gordon Briles, and included a significant number of reproductions of Millet’s works. Stage management was by Pat Loebæ, assisted by Terri Robertsæ. As I noted above, the story was by Mark Twain (Samuel Clemens). The manuscript was found by Shelly Fisher Fishkin, who had it adapted for the stage by David Ives. The original production was in 2007 in New York. The readaptation for Long Beach was under the direction of Shashin Desai. “Is He Dead?” continues at ICT through May 24, 2009. Only Thursday and Friday performances are up on Goldstar. For other performance, contact the box office at (562) 436-4610 or visit the ICT Website. Upcoming Theatre: Next Friday or Saturday (5/16) at 7:00pm, we’re likely going to the student dance production at Van Nuys HS, for which nsshere will be doing some of the lighting design. Sunday May 17 will be “big” at West Coast Ensemble, to be followed (hopefully) by “The Green Room at Hermosa Beach Playhouse on May 24 @ 7:00pm (pending ticketing). The end of May (May 28, 29, 30) brings “Fiddler on the Roof” at Nobel Middle School, where nsshere is doing the lighting design. June 6 we might go to the last weekend of “Marry Me a Little/The Last 5 Years” at East/West Players. , June 20 @ 8pm is “The Little Foxes” at The Pasadena Playhouse. Lastly, July 11 will bring “Fat Pig” at Repertory East Playhouse. Other shows pending scheduling and ticketing include “Spamalot” at the Ahmanson, Liza Minelli at the Hollywood Bowl, and the “Guys and Dolls” concert at the Hollywood Bowl. I’m also always looking for interesting productions on Goldstar and LA Stage Tix. I just got back from seeing A Year With Frog and Toad at ICT Long Beach. This is the second production I’ve seen at this theatre, and I am growing more impressed with them at each production. The venue itself is small and has excellent site lines, on par with the Mark Taper Forum. The Artistic Director announced the 2006 season at today’s show: it included Jesus’ Kid Brother (the story of Jesus’ younger brother, Larry… talk about an inferiority complex) and Twentieth Century (but it was unclear if this was the musical version). Anyway… returning to Frog and Toad. For those unfamiliar with play, it is based on the series of children’s books by Arnold Lobel. From beginning to end, from the coming of spring (and the end of Toad and Frog’s winter hibernation) to the next spring, when the birds fly back from their warm winter quarters, “Frog and Toad’ tells the story of two wonderful friends, Frog and Toad. They live down the road from each other in nearly identical houses and are close friends, so close that they share each other’s dream during their long winter nap. They spend their waking year sharing simple adventures: flying a kite, swimming in the pond, baking cookies, meeting with their friends in the neighborhood. They were written at the first grade level, and formed into a musical that went as far as being nominated for multiple Tony awards. It is less a continuous storyline (except for the Snail delivering the mail, a running (so to speak) gag), as opposed to a series of vignettes that demonstrate the deep and abiding friendship between the two. The production starred Gary Cearlock as Frog, Danny Stiles as Toad, Elizabeth Brackenbury as (Bird, Turtle, Mouse, Squirrel, Mole, and Mother Frog), Jennifer Clinton as (Bird, Mouse, Squirrel, Young Frog, and Mole), and Jeffrey Landman as (Bird, Snail, Lizard, Father Frog, and Mole). Music and Lyrics were by Robert Reale and Willie Reale. I found the show excellent. The actors playing Frog and Toad had (in my opinion) real chemistry. Even more amazing were the actors playing multiple roles, in particular Jeffrey Landman as Snail (who really went postal in the role). The Los Angeles Times noted it more as a kids show. They felt that it was “missing the resonances that would recommend the show to adults sans kids in tow.” They also saw weak chemistry between the leads (I disagree, but perhaps they grew into it as the show has progressed). Lastly, kudos to both the costume designer and the band, who were both marvelous. Next up: Tea at Five at the Pasadena Playhouse, starring Kate Mulgrew. Last night gf_guruilla, ellipticcurve, S&F and I went to go see “Once On This Island” at the International City Theatre in Long Beach. The evening started out poorly, as S&F was in a mood from being overtired. This mood spread to gf_guruilla, so that part wasn’t pretty. We all got dressed up (my wife was beautiful in a black velvet outfit; ellipticcurve was also lovely in a blue flowing dress; I wore my usual slacks, brown oxford cloth, tie and sportjacket, and S&F had one black pants and a nice red and black top… alas, in the craziness, we didn’t get pictures). However, although all of us were dressed up, we couldn’t get into a nice place for dinner. They all had wait times of 45 to 90 minutes. Later, we discovered why: The Reggae festival was in Long Beach the same weekend. Crowds, crowds. On to the show. This was our first time at ICT, and we were impressed. The theatre is on the size of the Mark Taper Forum, with good sight lines throughout. As for the production: this was the second non-preview performance, and there were some kinks. Although the acting was marvolous (the entire ensemble was great), the sound was less than purpose. I don’t know if it was bad quality mikes or bad speakers, but things sounded speaker-ish, which is not what you want. You want to hear the actors, not the speakers. For those not familiar with the story, here’s how ICT describes it: When peasant girl Ti Moune falls in love with wealthy landowner Daniel, the supernatural interference of four powerful deities catapults the star-crossed lovers into a fantastic swirling odyssey. Filled with hypnotic dancing, brilliant colors and beguiling music with a calypso beat, its infectious spirit and Caribbean charm are an uplifting tropical breeze that’s guaranteed to refresh! This enchanting tropical tale of romance, loss and redemption includes the songs: One Small Girl, Waiting for Life, The Human Heart, Pray, Mama Will Provide and Forever Yours. Our next show is in early March: Annie Get Your Gun at CMT. Until then, I guess we’ll just be doing what comes naturally.